For pre Wembley event lunch and dinner enquiries & reservations please complete our quick online enquiry below or call 02087339000. The Empire Restaurant at Wembley International Hotel, best located Wembley restaurant for pre-Wembley Event dinners. Superb centrally located Wembley restaurant near Wembley Stadium pre event dinners, restaurant near The SSE Arena, Wembley pre event dinners and restaurant near Wembley Theatre pre Wembley Theatre dinners. 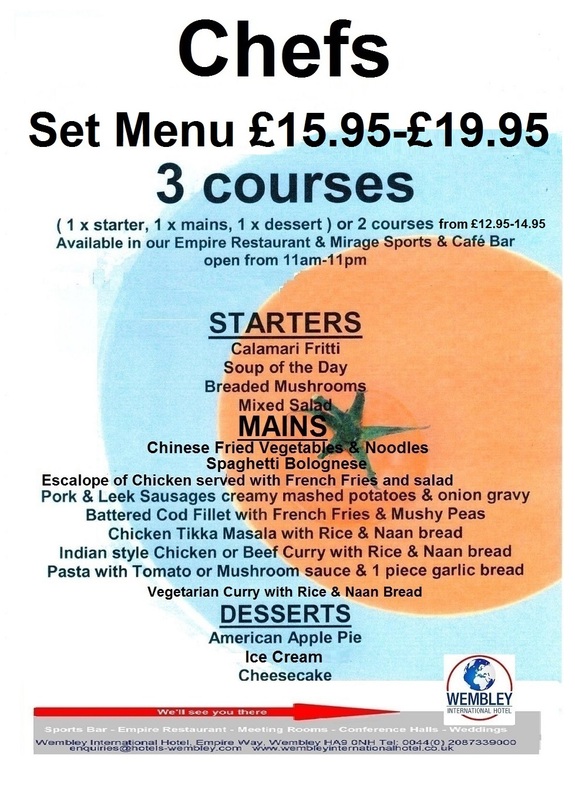 The Empire Restaurant is only 5 minutes walk from Wembley Park Tube Station. Pre London theatre dinners, pre London concert dinners at The Empire Restaurant only 15 minutes tube tide to central London. For groups coach Drop off and Pick up at the hotel is permitted for coaches and minibuses for non resident groups of guests who wish to dine in our Empire Restaurant. The Empire Restaurant Wembley is conveniently located and a great choice for pre Wembley Stadium event dinners, pre SSE Arena, Wembley event dinners and pre Wembley Theatre dinners. We have pre Wembley event menus for individuals, groups and student groups. Minimum 10 guests in a group and pre booking is required. We offer a superb group dining menu with excellent prices and our authentic Indian food menu for groups is absolutely delicious. Our Wembley restaurant and Mirage Sports Bar are amazingly located and a great choice for Wembley pre event dinners and Wembley pre event refreshments. The Empire Restaurant and Mirage Sports Bar are only 5 minutes walk to Wembley Stadium, The SSE Arena, Wembley and Wembley Theatre. Wembley Empire Restaurant near Wembley Stadium perfect location for pre Wembley event dinners. Wembley Empire Restaurant near SSE Arena Wembley excellent choice for pre event dinners.Wembley Empire Restaurant near Wembley Theatre superb choice for pre theatre dinners. For groups coach Drop off and Pick up only for coaches and minibuses for non resident groups of guests who wish to dine in our Empire Restaurant. Coach access is only available strictly on a drop off and pick up basis unless the hotel give written prior permission to park.